Articulated boom lifts, often called cherry pickers, are heavy-duty, versatile lifting machines used in a variety of industries. Their primary use is to lift people in aerial platform buckets to reach tall heights in the following industries: Agriculture, Painting, Roofing, Construction, Electrical, and Tree Removal. Articulated boom lifts are more appropriate when compared to telescopic boom lifts for environments that require work in tight spaces, or to allow the operator to clear obstacles if necessary. An articulated boom lift is operated by two different control panels. The first is at ground level on the machine, typically at the back of the counterweight. The second is located on the platform. The ground controls propel the machine, engages the platform, and has a kill switch for safety purposes. The engine is operated from the platform by a boot-like enclosure that has a foot-controlled lever inside it. The platform controls lift the platform, move it around, and have basic safety features such as a tilt warning and a capacity meter. In addition to the basic safety features, articulated boom lifts should come with a fire extinguisher and may come with harnesses to secure the operator in case of a fall. Articulated boom lifts have a lift weight capacity between 500 and 1,000 pounds. You must consider how many people and what types of tools are needed on the platform to determine which lift is right for the job. Gasoline, diesel, and propane are common fuels used in articulated boom lifts. Check the fuel type, prices for the fuel, fuel efficiency, and availability of the fuel type in your area before choosing a boom lift. Articulated boom lift tires come in several types of tread for various soils, and are in either two-wheel or four-wheel drive. 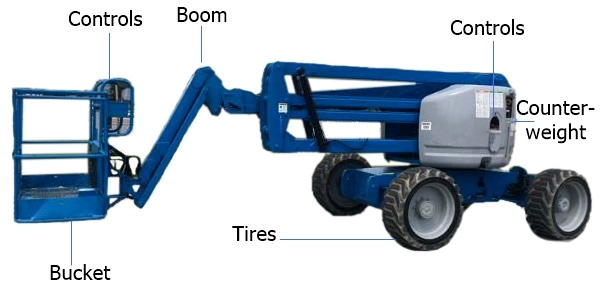 Consider the type of ground you will be operating on and find the right tires for the boom lift. If you will be operating on very soft or sloping ground, an articulated boom may be dangerous to use. With a range of 30’ to 150’ in vertical reach, articulated boom lifts can help you get to the top of trees, poles, and roofs. The booms can also extend horizontally, but watch the angle because it reduces the weight capacity and stability of the machine. There are several popular manufacturers in the articulated boom lift market including Haulotte, Genie, JLG, Snorkel, and Terex. Looking to compare articulated boom lift models side-by-side, from either the same manufacturer or competing manufacturers? RitchieSpecs allows you to compare the dimensions, specifications, and operational aspects of over 190 boom lift models. Once you’ve found the articulating boom lift model that fits your needs, browse articulating boom lifts for sale on IronPlanet and Ritchie Bros Auctioneers.